The buzziest restaurant in Chicago at the moment has a human-sized bee statue standing guard at its entrance. This 6-foot-tall bee with human facial features and human limbs wears a bowtie and a blazer, but no pants. As I stand before him, suddenly a flash of pink overcoat flies into view from 9 o’clock, belonging to a girl who can’t be older than 5. With all the wonder of seeing her cartoon hero in the plastic flesh, she wraps her arms around the bee’s leg. Her parents swoop in to capture the moment on their phones. All afternoon, the bee is like the Leaning Tower Of Pisa—visitors must take a photo with it or it’s like they never visited. As the line snakes to get inside the restaurant, those waiting are obliged to pose, document on film, then prove on social media they’ve paid respect to the patron saint of Filipino fast food. That saint is named Jollibee—both restaurant and mascot. 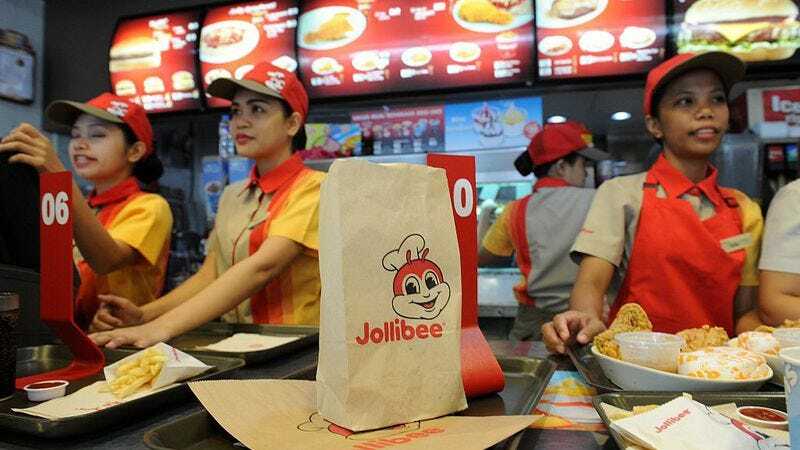 Jollibee is the McDonald’s of the Philippines, and since 1998, it’s begun to make major inroads into the U.S. market. Today there are three dozen Jollibees Stateside, most of them in California, with outposts in Virginia and Washington, plus its newest locations in the Chicago area. The chain is known primarily for two dishes: A fried chicken dubbed “chickenjoy” that’s served alongside gravy and rice, and a spaghetti with slices of hot dogs in a ketchup-like tomato sauce. Jollibee remains stupefyingly, nigh-incomprehensibly popular wherever it may land, especially among Filipinos. Covering the Skokie, Illinois Jollibee last August, The Skokie Review described it as drawing a “rock concert-like throng of fans.” By 7 a.m. the day of its grand opening, at least 400 customers had already camped out in the parking lot. Of course, this scene invariably repeats itself with every cult fast food chain that enters a new market. It happened when Chick-Fil-A opened in Chicago, when In-N-Out opened in Austin, when Shake Shack came to the Mall Of America… In each case, there’s a direct correlation between the length of the wait time and the distance from the chain’s home market. For example, when Guatemalan fried chicken chain Pollo Campero opened in Chicago in 2005, its devotees (mostly Central Americans) stood in line for six hours for a small taste of home. The images of that devotion, especially in the Instagram age, are a powerful one. Seeing the lines builds buzz. Buzz creates anticipation. Anticipation inflates taste. After all, the truth is the food at Jollibee won’t knock the socks off the fooderati, though it is decent by fast food standards. The “chickenjoy”—dark meat pieces by default—is reminiscent of Church’s chicken, with a smooth battered skin carapace and a juicy interior. The black peppery gravy is beefier by KFC standards, which means you’ll pour it over everything on the plate—rice, mashed potatoes, buttered corn. Hell, you’ll dip the burger in the gravy bowl, too. On the more adventurous spectrum of the menu is Palabok Fiesta, a vermicelli noodle dish with ground beef, a few measly shrimps, plus slices of hardboiled eggs in a uniquely savory sauce, topped with a pork chicharron dust. But the best thing I tasted was the peach mango pie. It’s like a crispy egg roll that oozes hot, tropical goo. Nevertheless, the quality of the food isn’t the point. Jollibee’s secret sauce is nostalgia; it’s a restaurant that hooks you as a child and doesn’t allow you to outgrow it. At every table, entire families huddle over boxes of chicken and spaghetti, slurping away in preoccupied silence as Top 40 radio plays its poppy soundtrack. The restaurant is awash in a cheerful decor of yellow and red. When I visited it was Christmastime, a holiday Filipinos obsess over, adding to the familial cheer. A poster on the wall blared, “Crispylicious! Juicylicious! In every step, made of joy.” That bee mascot stares at you, grinning from cheek to fat cheek, daring you to be even the least bit cynical. Marvin Gapultos, Filipino food blogger and author of the excellent The Adobo Road Cookbook, goes a bit further, saying Jollibee probably isn’t appealing enough to crossover to a non-Filipino clientele. (For what it’s worth, on my two visits, the restaurant was standing room only, and I saw a total of three white people.) Gapultos credits its massive success to the shrewd way it’s capitalized on that love of nostalgia within the Filipino diaspora.